The mission of Fighting Chance Rescue is to rescue, provide treatment and care, and to prevent the neglect and abuse of horses through education, investigation and rescue operations. We offer sanctuary for slaughter-bound, abused and neglected horses. We advocate for their welfare and enhance the human-animal bond. Since its founding in May, 2016 FCR has saved about 100 horses from abuse, neglect and slaughter. 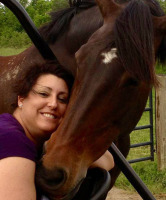 We are one of the only equine rescues serving South Eastern Ohio. 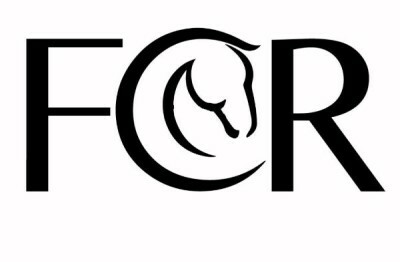 FCR accepts unwanted horses or those in need to rescue from individuals, humane societies and law enforcement. The rescue transports these horses and provides for their nutritional, medical, farrier and rehabilitation needs. We often rely on foster homes to complete the rehbilitation process. Rescue horses are re-homed after rehabilitation based on our screening process to ensure that horse and home are a good match. 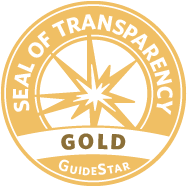 This program is supported from the rescue's general operating funds. FCR regulary attends horse sales and auctions to purchase horses that would otherwise end up in slaughter . As with rescues, we transport these horses and provide for their nutritional, medical, farrier and rehabilitation needs. We often rely on foster homes to complete the rehbilitation process. Auction save horses are re-homed after rehabilitation based on our screening process to ensure that horse and home are a good match. This program is supported by funds donated for this specific purpose. Destiny was Chance's dam. She and Chance both died of the effects of starvation. 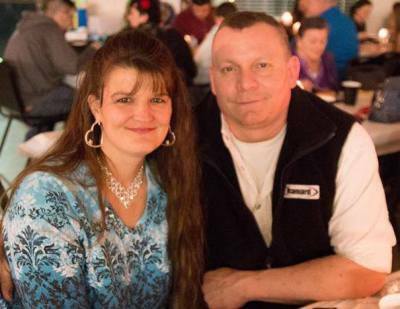 FCR maintains a fund to provide emergency feed to horses in mother and son's memory. The fund is distributed via the Brown and Adams county humane societies and Clermont County law enforcement. Contact these groups for help. Although Joe and Kim have different reasons for rescuing horses their main reason is that horses cannot help themselves. Joe’s horse history came from his sister. 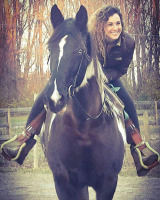 Lori always had horses and Joe would go on regular rides around the farm. 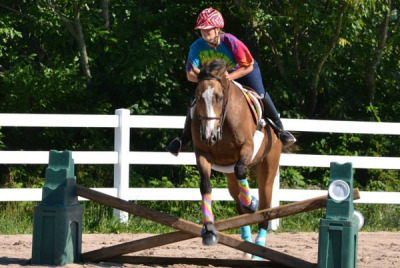 Joe has adapted to the hectic life of a horse farm well and has been supportive on every endeavor. The chores and maintenance of a farm is endless and he always takes things in stride. Joe has a kind calm nature that most horses are able to pick up on in his presense. Kim was literally born into the horse world. Though her many accomplishments could be mentioned from a training prospective and showing career, the things that matter the most to Kim are being the horses's voice since they cannot speak for themselves. Kim has endured many horse related injuries but has always been a voice for the horse no matter where life has taken her. 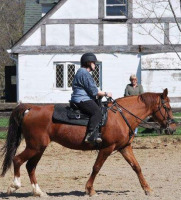 Kinder Sport Horses located in Hamersville Ohio started in February of 2009. It came in existence after they rescued two horses. 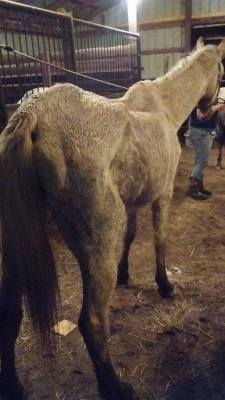 It offered a surrender service for owners that can no longer care for their horses. Once a horse is surrendered the Kinders make sure the horse is up to date on shots, provide coggins if needed and health certification .Part of a surrender program is to teach the horses the human animal bond. Lately they have been housing horses and ponies from local humane societies when the shelters are full. They also buy horses from auctions that may end up at slaughter. They put some weight on the horses, learn to gain their trust, provide some training in them and sell them to new trail and show homes. We charge a rehoming fee as the prices of horses are getting higher at local kill buyer auctions. This also allows the rescue to recoop funds to put back into rescues and saving horses from slaughter. However we always think horse first. and not whether we can recoup expenses. The Kinders take a lot of pride in finding companion horses new homes. As time goes on it's becoming harder and harder to find homes for these great horses. 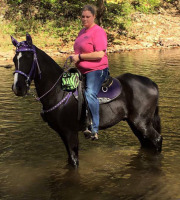 Kim also offers lessons beginner through intermediate riders on their horses or yours, she also manages a horseshow series as well has judging at local horseshows. Fighting Chance Rescue, Inc. was started in March of 2016. It came about based on the rescue of Chance , Destiny and Bugs. The Kinders decided to chase a dream of becoming a 501 c-3 nonprofit rescue - a dream that has come true. Learn more about the brutal truth of auctions and transport to slaughter . Watch this video about the HSUS investigation into horse slaughter export. 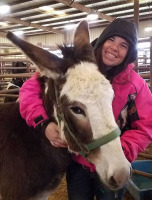 Ohio's Horses is a nonprofit organization whose goal is to increase public awareness about the issues facing horse owners in Ohio through educational, charitable, and other programs such as grants. You can help them helps us by using the Ohio's Horses license plate plate on your vehichles.